Location: South East side of the A640 Huddersfield Road and south side of Railway Street. Present state: Demolished. A large brick cotton warehouse survives on the south side of the station. 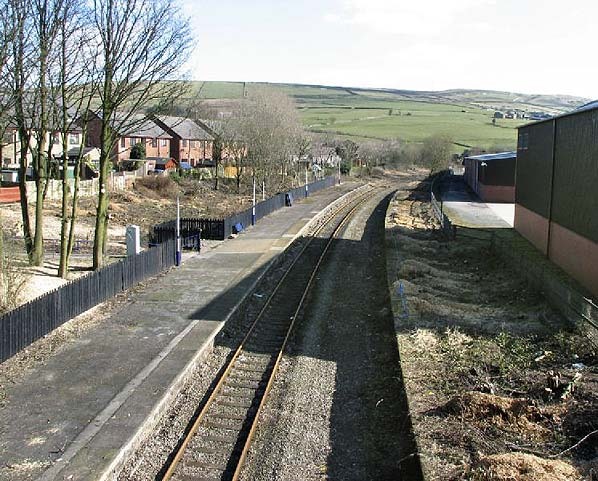 Notes: New Hey station was located on the 6 mile 54 chain Oldham Mumps to Rochdale line which was authorised in an Act of 1859 and built by the Lancashire & Yorkshire Railway (LYR). The Oldham Mumps to Rochdale line opened to goods traffic on the 12th August 1863 and to passengers on 2nd November 1863.
facilities. 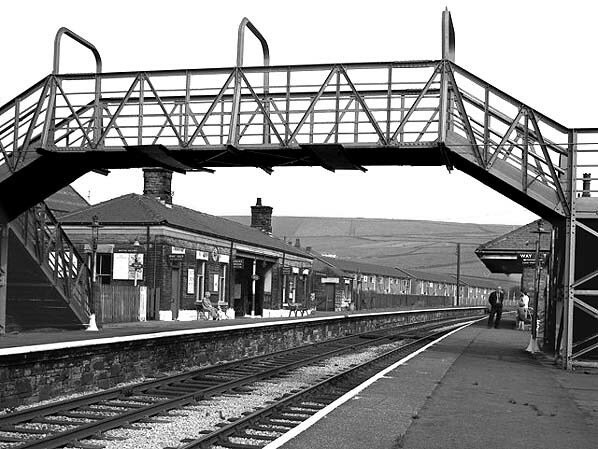 A footbridge at the north end of the station linked the two platforms. To the west of the station site was a small goods yard, and sidings on both sides of the line ran behind both platforms. There was a small goods shed on the north side of the line and, at a later date, a large cotton warehouse was built to the south of the station. There was a 10-ton crane on the south side of the line. The station signal-box was at the east end of the down platform. At its opening twenty-four trains in each direction served New Hey, operating between Rochdale and either Manchester Victoria or, in some cases, Middleton where connections to Manchester Victoria could be made. LYR to build a line from Thorpes Bridge Junction - which was on the Manchester to Leeds line, but closer to Manchester - to Oldham Werneth. A contract was let on 30th June 1875, and on 17th May 1880 the new line opened. With the opening of the new line a route had been created from Thorpes Bridge to Rochdale, via New Hey that became known as the ‘Oldham Loop Line’. Trains serving New Hey continued to run between Manchester Victoria and Rochdale, but most of them now travelled via the newly-opened line; a few services continued to run via Middleton. On the 1st January 1922 New Hey station became part of the London & North Western Railway (LNWR) when that company took over the LYR. However on the 1st January 1923 the LNWR was in turn absorbed into the London Midland and Scottish Railway (LMS). By 1938 New Hey station was served by fifteen local trains in each direction. On the 1st January 1948 New Hey became part of the nationalised British Railways (London Midland Region). During the last year of fully steam operated services in 1958 there were eighteen trains in each direction running between Manchester and Rochdale using the Thorpes Bridge route and three Saturdays excepted trains called that had originated from Middleton Junction and travelled onward to Rochdale. In June 1958 British Railways introduced Diesel Multiple Units (DMUs) onto the Oldham Loop. A Cravens built type of DMU (later known as class 104) which had twin power cars was used on the line as they were easily able to cope with the steep gradients. The service pattern at New Hey was a train every 40 minutes in each direction. The Reshaping of British Railways (Beeching Report) of March 1963 recommended the closure of the Royton branch to passengers but made no reference to the Oldham Loop or any of its stations. Nevertheless, September 1964 saw a decline in services calling at New Hey. The trains between Manchester and Rochdale became irregular, serving New Hey about every 45 minutes in each direction. From April 1966 there were further changes. The service pattern was altered so that most trains ran between Manchester Victoria and Oldham Mumps with only a few continuing onward to Rochdale. By 1968 New Hey had only an hourly service in each direction. The goods yard closed on 10th October 1966, whilst the station was unstaffed from 8th September 1969.
in the May 1972 passenger timetable advised that the Secretary of State had given consent to the withdrawal of passenger services between Oldham Mumps and Rochdale. 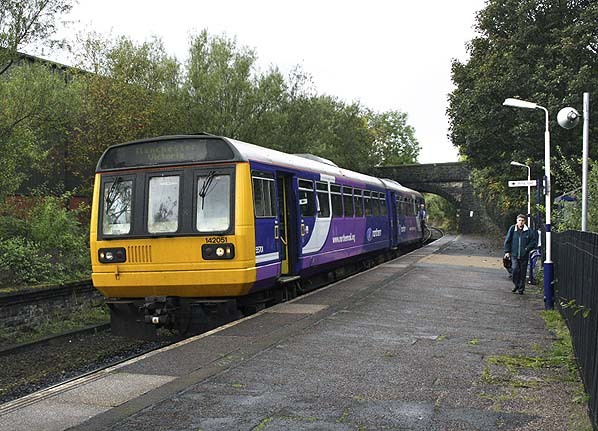 However, by this date, the South East Lancashire North East Cheshire (SELNEC) Passenger Transport Executive (Greater Manchester Passenger Transport Executive – GMPTE - from April 1974) had stepped in and agreed to fund the continuation of the service. By April 1974 the buildings made redundant by de-staffing had been demolished, and simple masonry shelters had been constructed. During the period of uncertainty about the station’s future, gas-lighting was retained, and instead of installing black-and-white ‘corporate identity’ nameplates, BR made do with paper posters giving the station’s name. 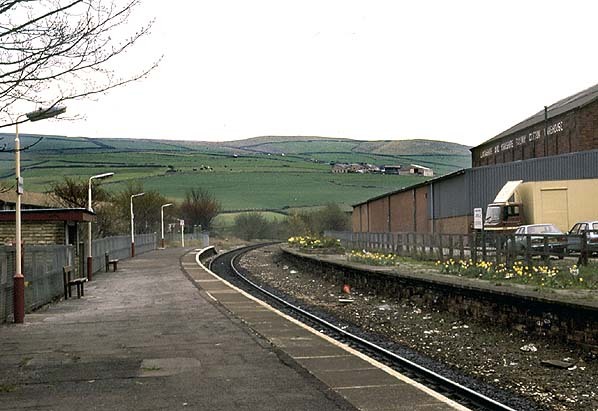 In 1980 the Oldham Loop was singled from Shaw & Crompton to Rochdale. This meant that the former Rochdale-bound platform at New Hey was taken out of use: the former Manchester platform then served trains in both directions. From May 1989 a half-hourly service to Manchester and to Rochdale was introduced at New Hey which attracted more passengers to use the station. In May 1995 the last alteration was made to the train services at New Hey. From this date the half-hourly service ran as an express between Oldham Mumps and Manchester Victoria, thereby accelerating journey times. the required works. To enable these works to go ahead the Oldham Loop had to close. New Hey, along with all other stations on the line, closed on Saturday 3rd October 2009. A number of special services, including steam-hauled trains, ran on the last day to celebrate the line and its history. Many local people turned out to watch the last trains run. The final train to depart from New Hey was the 23:25 Manchester Victoria to Rochdale service. The station was demolished in March 2010; all that remains now is a large brick-built railway warehouse on the south side of the station, which is now used by Newhey Carpets. This still has the words ‘Lancashire and Yorkshire Railway Cotton Warehouse’ on a wall overlooking the site of the former station..
Other web sites: Lost lines, a selection of pictures of the Oldham Loop line taken on 30th September 2009, shortly before closure. Class 25s and Much More web site has a feature called Farewell to the Oldham Loop with 51 pictures taken in August 2009. Sam Dixon's UK National Rail, Heritage Rail & Former Rail web site with 124 pictures of the Oldham loop line take two days before closure. 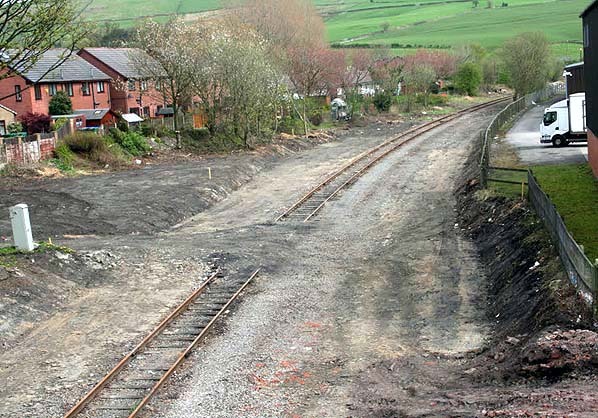 Tom Fenton's web site also has a feature Farewell to the Oldham Loop with 27 pictures taken in August 2009. Alan Perryman's Thistle 5 web site includes 93 pictures from the last day of the Oldham Loop. Sources: The Lancashire & Yorkshire Railway – Volume 2 J. Marshall, David & Charles 1970. ISBN 0715349066. Additional source Alan Young. Dean Lane, Failsworth, Hollinwood, Oldham Werneth, Oldham Central, Oldham Mumps, Derker, Royton Junction, Shaw & Crompton & Milnrow. 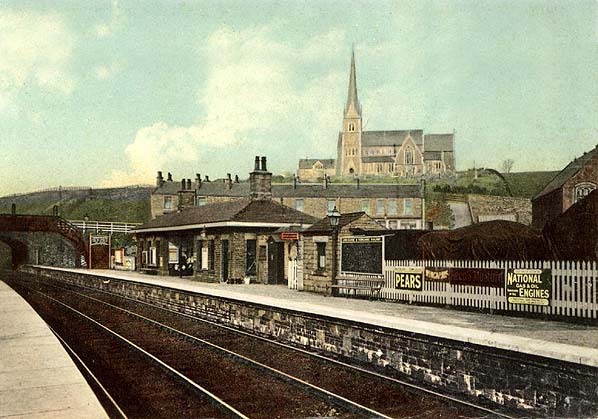 The up platform at New Hey station before December 1906. Looking north west from a passing train at New Hey station's in April 1954. Goods sidings ran behind both platforms. 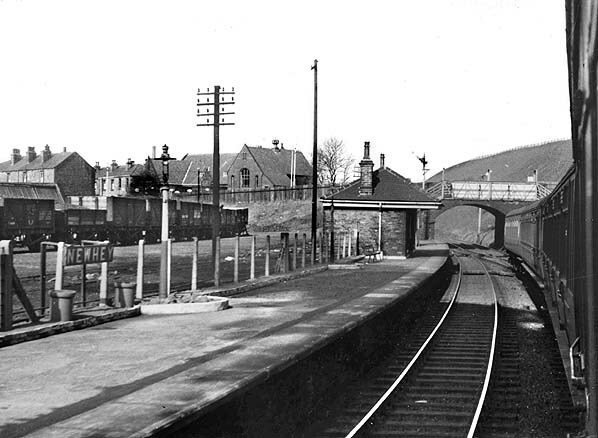 New Hey station looking south east from the down platform in 1968. 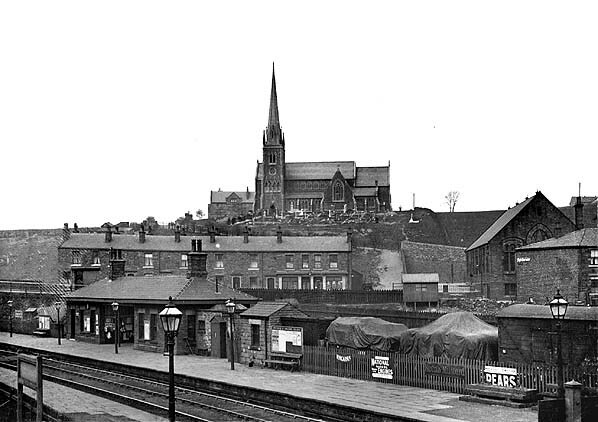 Although the station was still intact at this time, the goods yard had closed in 1966 and new housing stands on the site. 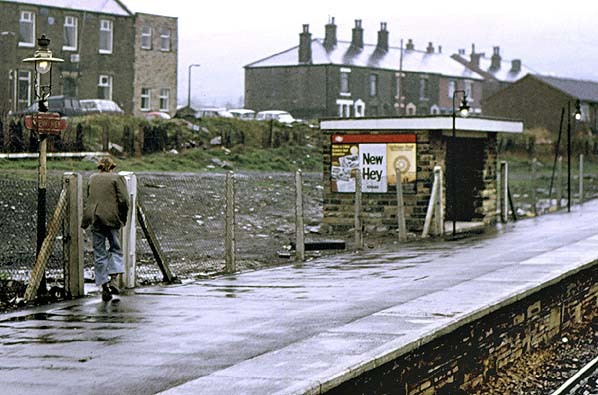 New Hey station's up platform in April 1974 after the stations main buildings had been demolished and it had been reduced to unstaffed halt status. Looking southeast along the former up platform at New Hey station in April 1990. The station was looking very run down at this point. Daffodil planting on the former down platform adds a little colour to an otherwise desolate scene. The former cotton warehouse was still extant and can be seen on the right. New Hey station looking south east in March 2010, six months after closure only the waiting shelter has been demolished. The site of New Hey station in April 2010 looking south from the Huddersfield Road overbridge shortly after the station had been completely demolished. 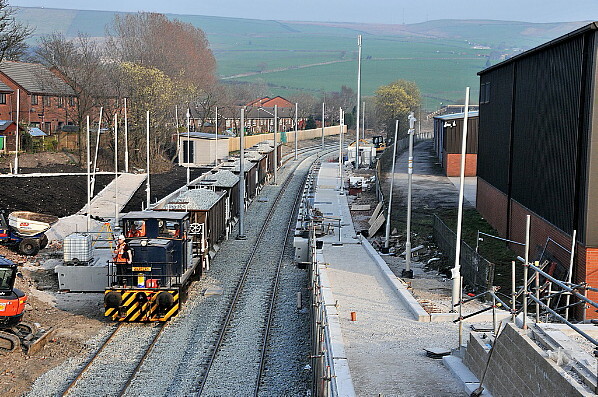 The site of New Hey station in April 2010 looking south from the Huddersfield Road overbridge during construction of the Metrolink tram route between Oldham and Rochdale. a tram stop was being constructed on the station site.